What can artists, who are usually driven more by the big picture than the bottom line, bring to Calgary’s corporate community? They’re about to find out, thanks to a new initiative launched by Calgary 2012, the folks organizing Calgary’s year as a cultural capital. This spring, 24 corporate artists-in-residence will be working with Calgary companies and/or not-for-profit institutions to bring creative flair to places that usually don’t come to mind when one thinks of stirring the creative juices. Artists, such as the Old Trout Puppet workshop and artist Noel Begin (Chinook Centre), choreographer Kim Cooper (Calgary Tower) and artist Shelly Ouellett (Holt Renfrew) will join forces to see what sort of creative mission they can undertake together. Others will work with not-for-profits such as the Pembina Institute, Fort Calgary Women’s Shelter and Outlinks. What impresses Calgary 2012 curator Michael Green, who matched artists to institutions, is how willing Calgary’s corporate community is to go along with the idea of incorporating artists into their little picture. “We were overwhelmed with the enthusiasm from the community of these opportunities,” says Green. What will they create? The Old Trouts will work with Begin to create an installation for the Chinook Mall near the food court in late August. Cooper will spend two weeks in June working with six dancers at the Calgary Tower, allowing audience members or passersby the opportunity to catch them in the act of creation. It’s part of a fascination Cooper has with site-specific work such as a 2009 show she created that was performed on different floors of the Grain Exchange Building. “Dance is so ephemeral,” Cooper says. “You do it and it’s gone. This work is to give people the opportunity to see us playing with ideas. Whiles it’s the first time for the Calgary 2012 program, Calgary’s corporate community has long found innovative ways to employ the talents of various members of the city’s cultural community. One of Calgary 2012′s corporate artists-in-residence, playwright Ken Cameron (First Calgary Financial), says there is plenty in common between bad art and bad business. That led to a unique relationship between Cameron and Brave Communications. But by day, Cameron works with Brave Communications teaching corporate professionals how to become better storytellers, in a workshop called What’s Your Story? The Hero’s Journey. The skills are transferable between the two areas, says Brave Communications president Kelly Schuler. The benefit of partnering with arts-based employees is something Calgary-based Westjet has known for a while. For a decade, WestJet has successfully built its brand, in art, by becoming one of the city’s go-to companies for some of our leading actors. The company employs a flexible scheduling system that allows actors who book a part to schedule their flight schedules around rehearsals, shoots and performances. Actors such as Kurt McKinstry, Patrick Creery, Barbara Gates Wilson and Scott Olynek work as flight attendants in between pounding the boards at theatres such as Vertigo and Lunchbox, and on television shows such as Heartland and Wild Roses. Creery – who has appeared in many television shows, films and plays – uses his hard won performance knowledge in front of crowds, whether they’re in a theatre, or the cabin of a plane in mid-air. Westjet spokesman Robert Palmer says his company earns huge benefits by finding ways to keep the actors on their payroll flying when they aren’t acting. “Let’s face it, there’s not much to differentiate airlines,” he says. “How to stand out? Your people. “We’re always happy to see people (who) have performing experience,” he continues, before adding that the same considerations do not apply to hiring pilots. When playwright (The Whimsy State or Outer Republic of Baldona) AJ Demers isn’t sitting in on rehearsals of his next play, he works as a consultant for various companies, including Suncor, Nexen, Encana and the City of Calgary (you may have seen him emceeing the opening of the new Peace Bridge). Demers, an alumnus of the Loose Moose Improv, earns enough to keep him afloat while various multinational corporations get to show a sense of humour to their thousands of employees, turning dry presentations into something a little more fun. And if the generic skyscrapers make our downtown look like it could be anywhere, North American, maybe the trick is to use your ears and not your eyes. 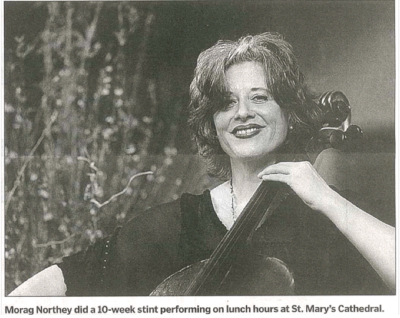 Recently, cellist Morag Northey completed a 10-week stint performing during lunch hour at St. Mary’s Cathedral downtown. It was a gig that offered Northey, who also recently completed a run playing in the orchestra during Theatre Calgary’s production of Cats, a lose-up and personal look at a lot of the suits in the corporate suites, who wandered out of their office towers into the church to listen to her play. “I love Calgary’s corporate community,” Northey says. “I view them as my friends. I would like to share more time with them, because I didn’t have a negative experience with any of them. Not coincidentally, the corporate community happens to agree. “The return you get even on a relatively small investment (in arts and artists) is very meaningful,” says D’Arcy levesque, the vice-president of public and government affairs at Enbridge, a company that sponsors everything from the Enbridge playRites Festival of New Canadian Plays to the Governor General Awards for the Performing Arts. “Investments in the arts do pay dividends and I think arts groups work really hard in helping to ensure that their sponsors are recognized in the community for the contributions they’re making.